3185 farmers markets were just added to Real Time Farms this week. 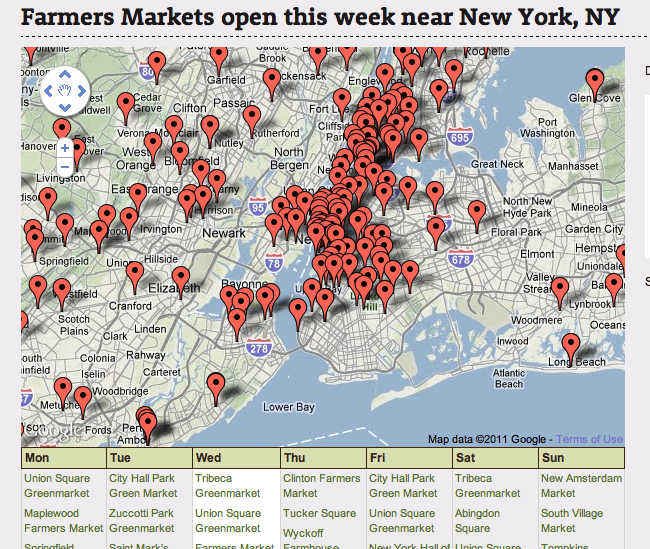 The USDA released 2011 farmers market data for public use on Data.gov. (Thanks USDA!) Co-founder, Karl Rosaen, spent the past few days, 16 hours yesterday alone, geocoding, writing scripts, sorting, sifting….all that data geek magic, to import 3185 new farmers market to Real Time Farms. There are now 6764 markets on Real Time Farms. Check it out for yourself ! This entry was posted in Messages From the Founders and tagged cara rosaen, data.gov, farmer's market, karl rosaen, national farmers market week, Real Time Farms, USDA, Wendy Wasserman. Bookmark the permalink.